Thus no amount of appealing to Maxwell’s equations (derived pre-Einstein)11 or any other well-known physics can refute the notion of free choice for the one-way speed of light, or more precisely, the conventionality thesis of distant simultaneity. In most cases where this has been attempted it has been largely based on petitio principia (or begging the question, that is, assuming in the premise that you are trying to prove). Often the assumption is very subtle. But in all such cases, in the premise the speed of light is implicitly assumed to be isotropic and subsequently used to ‘prove’ that the one-way speed of light is equal to the isotropic (or two-way) speed of light. And some argue that the one-way speed of light being different in opposite propagation directions is absurd. Nature just cannot be that way. They base that view on symmetry arguments, saying light must travel the same speed in all directions because that is the way the universe must be. This misses the whole point of the conventionality thesis. Because it is empirically impossible to measure the one-way speed of light, due to the fact that distant clocks cannot be synchronised except by sending a light signal, then one cannot say anything meaningful about the one-way speed. Thus we are faced with a circular argument. To determine the simultaneity of distant events we need to know a velocity and to measure a velocity we require knowledge of the simultaneity of distant events. The occurrence of this circularity proves that simultaneity is not a matter of knowledge, but of a coordinate definition, since the logical circle shows that a knowledge of simultaneity is impossible in principle (emphasis added). This fact is quite significant because, since 2001, I have largely supported the ideas that Lisle has presented. Others within the creationist community have not been so accepting of them or have not really understood them. Personally I now take the position that a biblical creationist model based on the ASC, or at least the concept of defining an initial creation scenario that involves the ASC, or a variant of it, such as suggested in the two above listed papers, is the best solution to the creationist starlight travel-time problem. In such a case, there is no light travel-time problem. In explaining to lay Christian audiences I have found that the biggest stumbling block to them understanding the concepts behind such a simple solution is that they have already formed in their minds the notion that the speed of light is isotropic, as if this has been proven by experiment. Certainly this is true for those with some scientific knowledge. Thus, implicitly, they assume the Einstein Synchrony Convention (ESC) to be some sort of absolute universal rule, and that assumes isotropy for the speed of light. After that they cannot conceive of how light from the distant galaxies could reach Earth instantaneously. Distant clocks are unsynchronised with Earth clocks. In the cosmogony Lisle considered the divine creation of all stars and galaxies is assumed simultaneous by convention. It is not (even in principle) empirically measureable. So you could even say that it is irrelevant. What is relevant to the ASC model is that the event of their creation was timestamped by when the light first arrived at the Earth. That was measureable. And that was true for all stars on Day 4. We present a solution for the distant starlight problem that is consistent with Scripture, Special Relativity, and observations of a young cosmos that is based on a special divine choice of initial conditions and a new synchrony convention. The initial conditions constrain the spacetime coordinates of all stellar creation events (Genesis 1:17) to be just outside the past light cone of Earth’s Day Four but within the past light cone of Earth’s Day Five while also being causally independent from one another. The synchrony convention interprets God’s numbering of the creation days in Genesis 1 as prescribing a time coordinate for each location in the cosmos, a coordinate we call the Creation Time Coordinate (CTC) (emphasis added). The main features are the special choice of initial conditions and a ‘new’ synchrony convention. I put the word ‘new’ in quotes because I don’t agree that it is actually a new convention. In fact, the model they present is Lisle’s ASC model, only that they have explicitly (and correctly) defined their initial conditions. They make use of the standard relativistic light-cone (drawn under the assumption of the ESC with the speed of light as the isotropic two-way speed c). They show their coordinates (on standard axes labelled x and ct) with a hypersurface representing the Genesis 1 time coordinate (CTC) defining the Day 4 initial creation of the stars in the heavens. However if one were to extend the axes to the Hubble length (of order c/H0), their hypersurface would be shown to be asymptotically close to the past light cone surface for Day 4. Hence on such a diagram one would be hard pressed to see any substantive difference with that prescribed in Lisle’s ASC model. Tenev et al. make the claim that their CTC’s are an improvement on Lisle’s model because they are defined as ontologically objective coordinates. However in my opinion they are identical with Lisle’s ASC coordinates when one considers the earth as the only point of reference. That is only Earth observers matter in the Genesis description. This point is conceded in the paper. They make the argument that their approach is superior. Lisle’s approach is observer dependent, whereas they invoke the singular independent Observer, the Creator Himself. Hence ontologically they define a singular special initial condition for the creation of the stars on Day 4. In regards to Lisle’s ASC model, we can say that there were ‘observers’ on Earth, and only on Earth, on Day 4. These could have been, for example, crystals, or plants. Crystals respond to light of various wavelengths and so do plants. Hence when light from the stars initially arrived on Earth on Day 4, these observers define that initial condition. I would make the argument that this fact makes it objective, since this is the only frame of reference that biblically matters. I have always used this argument when presenting the ASC model. So in terms of ontology any real difference between Lisle’s and the CTC model is marginal at best. Having said that, I applaud the clarity with which Tenev et al. define their model. In my view, it is a small refinement on the ASC model. 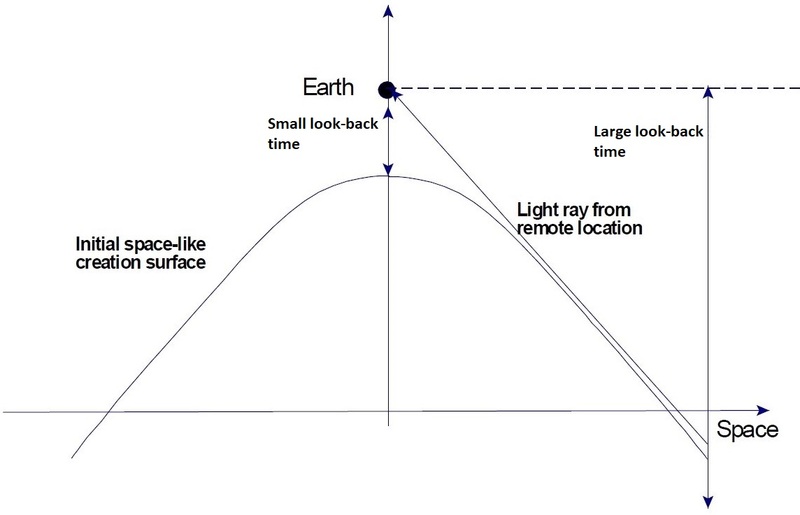 Our solution to the light travel time problem will be based on presentism and the fact that GR specifically and the relativity principle in general prohibits any empirical method of determining a putative hypersurface in space-time that is the present. Thus, any spatial 3-surface that represents an actual ‘now’ (which must exist according to presentism, though in principle operationally undetectable) and explains the distant light arrival is acceptable (emphasis added). Tenev et al.’s CTC coordinates define the ‘now’ for the creation of the stars on Day 4. But no method can empirically determine such a hypersurface. No experiment can be carried out—given unlimited resources and time—that could get a definite empirical result. The problem is that the CTC’s assume unsynchronised clocks. The authors impose a sort of God-synchronised condition on them, but from an experimentalist point of view they are unsynchronised because without sending light signals between the putative clocks they are, by definition, unsynchronised. Any Earth observer cannot know the state of distant clocks without comparing them with his local clock. And such an experiment requires the assumption of a synchrony convention. This may not be very satisfactory, but I believe the reality is what God’s Words say. However we can never devise an experiment that can uniquely distinguish a biblical model (cosmology and/or cosmogony) from all others and determine some objective reality for the cosmos, even though we know that all non-biblical models are spurious. Figure 1: Presentism v. Eternalism: Under presentism time is real and the present we experience is universal. This is illustrated by the plane (left) representing space but no past or future. Under eternalism time is an illusion and the past, present and future all exist together. The line shown here (right) is the worldline of a particle passing through the block-house of spacetime. Solid line is in the past and the broken line is in the future. Einstein was an advocate of eternalism.18 And Dennis quotes Einstein. Yet, as Dennis correctly points out, this does not mean that the present is not real, i.e. that such a concept does not exist in spacetime. What it means is that it cannot be operationally empirically determined. In philosophical terms the ASC defines a universal ‘now’ for all events regardless of their location in space. From Dennis’s perspective he would argue that this convention requires a presentist worldview. This is not necessarily the case. General Relativity does not require that one accept a particular philosophical worldview. The application of General Relativity may be valid regardless of which philosophy one may take; yet interpreting the meaning of that application may vary according to one’s philosophical position. Even the model presented by Dennis does not depend on a presentist philosophy. 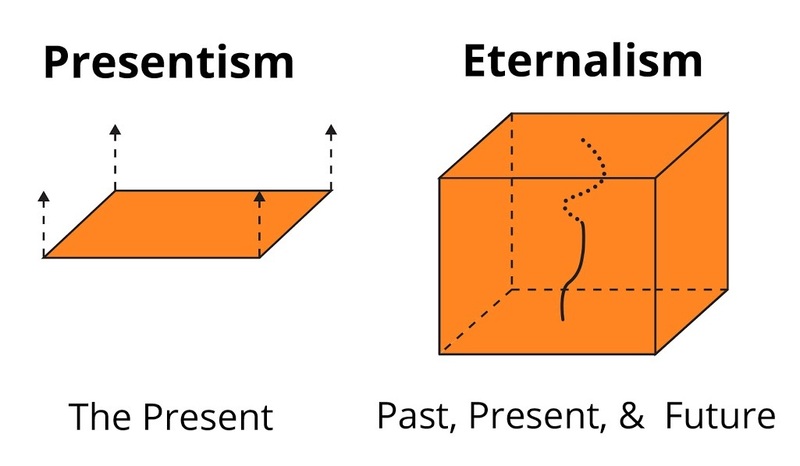 I would think that eternalism is the philosophical view currently held by most practitioners of Einstein’s General Relativity theory, in which the universe is seen as a block-house four-dimensional construction, with the past, the present and the future all existing together. See Fig. 1. As such time does not exist; it is only an illusion. Instead it is ‘spatialised’ with the three usual space coordinates into a 4D metrical representation of spacetime. However, even eternalists have to deal with the passage of time. They might have more of a problem putting it into words, but mathematically it is well described by the choice of the spacetime metric. One’s choice of philosophy regarding time, e.g. presentism or eternalism, does not necessarily determine one’s cosmology or cosmogony.21 Some insight can be gained from a discussion of the philosophy of time, but a particular choice is not essential. Besides there is no empirical way to distinguish between presentism and eternalism. They are philosophies and as such are only assumed. I contend that what is essential is one’s choice of clock synchrony convention. That choice leads to how one interprets one’s cosmogony. Nevertheless there is no natural choice of a synchrony convention. You cannot say one is ‘correct’ and that all other conventions are ‘wrong’. …, the strongest argument for the reality of time is from the presupposition of Christian theism. Time is real and the biblical account steps off the sequence very definitively in Genesis Chapter 1. Events are timestamped by when any Earth ‘observer’ sees them happen. Tenev et al. argue that it is the Creator who defines that sequence via special objective time coordinates, especially for Day 4, so that all stars are created so that their light arrives during Day 4. Dennis works from the basis that presentism is the correct philosophical view consistent with the Bible, though I would argue that his model does not depend upon it. He outlines how one might construct a cosmology, based on general inhomogeneous models. These considerations all point to a solution that is based on the recognition that Einstein’s Field Equations (EFE) depend upon the specification of an initial condition specified on a given initial spatial hypersurface. The general inhomogeneous solution shows that the time of the initial spatial hypersurface is arbitrary within the mathematical framework of General Relativity. This is a very important point to note: the initial spatial hypersurface is arbitrary within the mathematical framework of General Relativity. We are free to choose. This then leads to the notion of a difference in the speeds of the incoming and outgoing light rays. And by appropriate choice of a free parameter in his model the incoming light rays from distant stars can reach the earth instantaneously. Thus by the end of his paper, Dennis gets to a similar beginning creation scenario as Tenev et al. See his Figure 9. This is a sketch of what he expects to develop with further research. Dennis describes a sequence of hypersurfaces indexed by cosmic time t, which records the days of creation from Day 1. Each hypersurface represents the universal ‘now’ for that day. Each hypersurface is spacelike, meaning events are not causally connected, and the light from all events on each day (creation of stars on Day 4) arrives at the earth for the first time during that day. This is the same result as in Tenev et al.’s and Lisle’s models. Figure 2: Reproduced from Dennis’s Figure 8. A solution to the light travel time problem based on a hyperbolic initial creation surface given by a function t [vertical axis] in terms of the standard big bang FLRW cosmic time coordinate. Due to the curvature of the surface the look-back time at the earth increases with distance. The creation surface occurs simultaneously at the beginning of day one, even though the ‘look-back time’ (relative to the FLRW extrapolated ‘cosmic time’) for distant events is very large. The null rays of the past light closely follow the hyperbolic curve. The same is true for all creation Days. their models and Lisle’s. Both employ initial hyperbolic creation hypersurfaces. Both are centred on the earth. Both asymptotically approach the past light cone. In that limit they are the same as Lisle’s in this regard. Dennis starts with Day 1 creation, whereas Tenev et al. focus on the Day 4 creation of the stars. Nevertheless for Day 4 both would draw the same initial spacelike hypersurface for the creation of the heavenly host. This is the first time where 3 different authors have arrived at similar biblical creation cosmological scenarios. Each involves the concept of the universal ‘now’ describing the whole universe at the same moment of time as recorded by local Earth clocks. Each involves special initial conditions for the creation of all stars in the universe so that their light arrives at the Earth for the first time on Day 4. The days of creation are 24-hour Earth days and the rest of the universe is as young as the earth except for 3 days. Since the concept of a universal ‘now’ representing a state of the universe at any moment in time cannot be rejected by any operational empirical consideration, we are free to choose. Based on the biblical account, where time advances, day after day, and events occur when they are observed, it would seem to be the most appropriate conclusion to state that a universal ‘now’ is the correct philosophical view to interpret the Bible, especially the Genesis creation narrative. We see the cosmos as it is now; we are not looking back into the past. The past is gone forever. But just because we observe a ‘mature’ galaxy or star does not imply that it evolved from some simpler primordial form. The Genesis account does not indicate such a thing. What it does indicate is that all stars, and by extension galaxies, were created on Day 4. Thus they were created “mature.” None are more than 6 thousand years old. This can be understood from any one of these cosmologies discussed here (Lisle, Tenev et al. and Dennis). There is no light travel time from distant stars and so we observe the ‘present’ state of the universe at the moment we see it. The language of the Bible is not that of the Einstein Synchrony Convention. That would mean, when viewing the cosmos, we are looking back into the past. But the language used employs the Anisotropic Synchrony Convention. That means we are looking at the present state of the galaxies in the cosmos. The critical issue in all this is not which philosophy of time we accept (though that might influence our choices) but which is the clock synchrony convention used in the biblical narrative in Genesis. Historically most people held to the idea that what we observe in the universe (including all stars and galaxies) is the present state of the universe. When we look at galaxies we are not looking into the past. We see them in their present state. This is what we call a universal ‘now’. (Universal means it includes the whole universe.) It implies that the light travel-time from the distant stars is instantaneous. This is consistent with Lisle’s Anisotropic Synchrony Convention (ASC). In the past 200 years this viewpoint started to change; firstly among the scientific community and then the educated public. By the time the speed of light was measured and Einstein introduced his Relativity theory, the universal ‘now’ was rejected. Einstein assumed a particular clock synchrony convention (ESC) which held that the speed of light was the same in all directions. The most popular philosophical viewpoint now holds that when we look at galaxies we are looking into the past. But the universe does not tell us which philosophical viewpoint is the correct one. It is also important to realise that whatever view one takes it is only an assumption. Before the last few hundred years and Einstein there was no biblical creationist starlight travel-time problem. In the 1600’s Sir Isaac Newton considered that the speed of light and gravity were instantaneous, i.e. that there was no delay between the source and the observer. Scientists believed in the universal ‘now’. Only after the 17th century, when the speed of light was measured and Einstein’s Special Relativity was promoted, was the universal ‘now’ replaced under a new philosophical assumption. This involved Einstein’s choice of clock synchrony convention. Einstein’s assumption created the starlight travel-time problem in a large universe for biblical creationists. By rejecting the ESC for interpreting the biblical text, and by assuming the ASC is what the Author used, we can easily explain starlight travel time. There is no problem because we are seeing the present state, not the past state, of all the universe. Above I presented the uniquely convergent outcomes of three separate creationist cosmologies. They are not the same but essentially arrive at the same conclusion. This fact then argues for the universal ‘now’ as a simple approach in explaining that there is no light travel-time problem. No laws of physics are changed by assuming the ASC is the convention of the Bible. All laws of nature remain the same. There is no denial of modern physics, including relativity theory. In fact, this is all in keeping with modern physics. Different philosophical viewpoints in how we look at the universe have been discussed and debate on them continues. But the real question here is: What is the viewpoint that the Author of the Bible took in the written text? The plain language of the Bible argues that not only is the earth young (i.e. six thousand years old) but the same can be said of the whole universe also. On Day 4 about six thousand years ago, God created the whole universe, meaning all the stars and galaxies. He did it in such a way that the light from them all arrived at the earth on that Day 4. So what we see today in the universe is not millions or billions of years old but only about six thousand years old. I would like to thank Alex Williams and an anonymous reviewer for some valuable insights and suggestions. Newton, R., Distant starlight and Genesis: conventions of time measurement, Journal of Creation 15(1):80–85, 2001. Simultaneous by convention but not by any empirical method of measurement. It is assumed to be the case, or even defined that way. Timestamped means the moment of the event is clocked or recorded by a clock. In the case of the ASC (a convention) all events occur when the light of the event is first seen. This is the normal everyday experience. When we see something happen we say it happened the moment we saw it. Lisle, J.P., Anisotropic Synchrony Convention—A Solution to the Distant Starlight Problem, Answers Research Journal 3:191–207, 2010. Hartnett, J.G., The Anisotropic Synchrony Convention model as a solution to the creationist starlight-travel-time problem, Journal of Creation 25(3):56-62, 2011. Only the two-way speed of light is measureable but that does not mean that one cannot choose the one-way speed as a consequence of one’s choice of a clock synchrony convention. See the following endnote 7. Thus in any measurement of the speed of light, where a single clock is used and the beam is reflected from a mirror, the average speed for the round trip—out to the mirror and back to the source—is the measured speed c. This is called the two-way speed of light or the isotropic speed of light. If the incoming one-way speed of light is infinite then the outgoing speed must be ½c so that the average speed is c for any two-way measurement. The one-way speed cannot be measured. See secular discussion in Wikipedia: One-way speed of light, en.wikipedia.org/wiki/One-way_speed_of_light, accessed 24/9/2018. Lisle, J.P., The Physics of Einstein, Biblical Science Institute, subsection “The Epsilon Equations” pp. 221–231, 2018. Usually the choice of coordinate system is dictated by which is the most convenient to understand the physics. For the same reason a timing convention is chosen that best simplifies the equations describing the physics. Most physics in the text books is written in terms of the assumption that the speed of light is isotropic and observer independent (inertial reference frame). This is the Einstein Synchrony Convention or ESC. Maxwell’s equations contain the propagation constant (usually represented by the parameter c) for electromagnetic radiation. Later this was identified as the speed of light. However Maxwell’s equations are derived in a closed system, where the speed of propagation is isotropic. Hence one would not expect c to represent anything but the two-way speed of light. Lisle, J.P., The Physics of Einstein, Biblical Science Institute, pp. 240, 256, 2018. Tenev, T.G., J. Baumgardner, and M.F. Horstemeyer. A solution for the distant starlight problem using creation time coordinates. In Proceedings of the Eighth International Conference on Creationism, ed. J.H. Whitmore, pp. 82–94. Pittsburgh, Pennsylvania: Creation Science Fellowship, 2018. Dennis, P.W. Consistent young earth relativistic cosmology. In Proceedings of the Eighth International Conference on Creationism, ed. J.H. Whitmore, pp. 14–35. Pittsburgh, Pennsylvania: Creation Science Fellowship, 2018. Hartnett, J.G., Update on the ASC model and the one-way speed of light, biblescienceforum.com/2018/09/16/update-on-the-asc-model-and-the-one-way-speed-of-light/. Hartnett, J.G., Cosmology’s fatal weakness—underdetermination, Journal of Creation 32(2):15–17, 2018. Eternalism is a philosophical approach to the ontological nature of time, which takes the view that all existence in time is equally real, as opposed to presentism. For a brief discussion see reviewonphilosophy.wordpress.com/2011/12/12/eternalism-vs-presentism/. Calaprice, A., ed.,The Expanded Quotable Einstein, Princeton: Princeton University Press, p.75, 2000. Einstein, A., Ideas and Opinions [Modern Library edition]. New York: Random House, p. 411, 1994. As stated, most modern relativists would accept the eternalist philosophy, along with Einstein, where time is viewed as an illusion. But atheist physicist and cosmologist Lee Smolin believes that time is real and that the laws of physics do change. He and his co-author Unger suggest that the laws of physics evolve and hence for that to occur time must be real. See Hartnett, J.G., The universe and the reality of its creator, Journal of Creation 30(2):24–25, 2016. I’d appreciate some help here. I have been trying to follow the ASC idea from the earlier days and have read both Jason’s and your posts over the years. But I still am not able to “get” something. There is NO question that any creationist Christian, such as I am, will admit to Young Earth Creationism. All creationist Christians will admit to this. However, I notice a very subtle ambivalence of many creationists, especially those who hold to ASC, including Jason, and if I’m not mistaken, even you too, John, to steer away or subtly NOT mention YUC (Young Universe Creationism)! There is NO question that the Universe was created in six 24 hour periods, notwithstanding that the Sun and the Earth were NOT there the first day. However, we DO know that Cesium 133 did exist on the first day, ergo, there was the SAME day length then as we use today! a) please let me know your own position, or a link, on YUC. b) please link to simple text that explains ASC in the context of YUC. In other words, I’d find most helpful to my ongoing Christian walk to know HOW ASC explains, supports, and details YUC. Any creationist proposition or theory that skirts YUC is in my view “weak”. Maybe helpful, and I am not saying we will know precisely the mind of the Lord, but it should support YUC unmistakably. Not merely YEC. Thank you. That surprises me very much. I would say that believers in the ASC model would without a doubt subscribe to a young universe. Based on the ASC as a synchrony convention, all objects in the universe are only about six thousand years old. There is no need to suppose any time dilation in the cosmos where the earth is young but the universe is old. I agree as do all biblical creationists. I don’t know if what I suggested above is what you are seeking, but as stated above the ASC model is by its very nature a YUC cosmogony. I don’t agree. You cannot say definitively that what Genesis 1 describes is YUC. It definitely is YEC. Everything must conform to 6 x 24 hour (Earth clock) Creation days. But to say that millions of years cannot pass in the cosmos while 1 day passes on Earth during God’s creative process is limiting God. Having said that I now predominantly subscribe to the ASC model which is YUC. I’m trying to grasp what is really different between ASC models and arguing that the Genesis text is in phenomenological language. Suppose that God created all of the stars millions or billions of years before the earth such that the light from each star reached earth on day four. This is described as God creating the light on day four because that’s how it would have appeared to a human observer who was watching this process unfold. Aspects of the genesis have a long history of being interpreted in a phenomenological fashion (see moon as a light, other planets being larger the moon, various stars being larger than the sun). So it seems natural and straightforward to understand distant starlight in this way. But instead ASC and related models invoke this idea of the speed of light being different in different directions. This seems much more controversial and difficult to explain to lay audiences than the phenomenological approach. So why is this a useful approach? What does it give us that we don’t get from the more straightforward phenomenological approach? The difference that you started your suggestion with ‘millions and billions of years before the earth’ which means you have already chosen the ESC as some sort of absolute truth. But we simply do not have the luxury of doing that. No, I haven’t chosen ESC as an absolute truth. The author of Genesis could be using ESC + phenomenological language or could be using ASC. Why do you favor the later over the former? Your use of the words millions and billions of years means you have assumed the ESC. This is what that convention means with the isotropic speed of light c. The time for the passage of light at about 300 thousand km per second requires that for a very large universe. So your starting premise is that assumption. It is not that I prefer the ASC. The point is, what is the language of the Bible? I suggest it is the natural language all people once used prior to the measurement of the speed of light. They would say when they of served an event is when it occurred. Yes, the millions and billions of years only make sense under the ESC. But the whole point of that paragraph was to explain how you could equally keep ESC and explain the starlight via phenomenological language. So of course that paragraph “assumed” ESC. But that doesn’t mean I that I assume that millions and billions of years is the only accurate way of describing it. Rather, it is simply a *possible* way of understanding it. When I say “prefer” I don’t mean to say that which one you prefer to be true, but rather which one you think is more likely to be true. I agree that it make sense to understand the text as the natural language all people used prior to the measurement of the speed of light. Furthermore, it is certainly true that prior to measuring the speed of light humans would have described distant astronomical events as happening when they became visible from earth. But it seems to me that you could understand that as a case of phenomenological language independently of whether you adopt ASC or ESC as your synchrony convention. Let me put this another way. Let’s suppose someone asks about the distant starlight problem. I tell them that the bible records the event that way because that’s how it would have appeared to an observer on earth. Is my explanation incorrect? Does it differ from ASC? How so? What makes ASC a better or worse explanation? If you say the event is clocked as occurring when it is seen then that is valid under any convention. It is true for either ESC or ASC. The problem you would have saying ESC plus phenomenological language is Exodus 20:11. Those events all occurred in 6 days. The ASC model says they did. The universe is only 6 thousand years old but under ESC you have to use time dilation to make that so. John, I still have a niggling question in the back of my mind. Perhaps you, Lisle, Tenev, Dennis are implying it or have actually said it, but I am missing a connection somewhere. Please let me set up my thoughts before I ask the question. 1) Having read articles on this subject for many years from you, et al., I have come to understand that God created the stars, galaxies AT their nearly-present-day offsets (less 6000 years) from each other on the fourth day, in an already opened out heaven which he had created earlier on the second day. 2) This means that I do not now think that God created the stars, etc near about or even inside the solar system edge and then moved the objects out at speeds way, way way beyond the current speed of light. 3) I also believe that after he created the stars, etc on the fourth day, God did not then modify the properties of intervening space so that space itself “expanded” thus resulting in the real distances we see now between the stars, etc. All the above he could do being that He is still in the creation week and God IS using his infinite powers to do things in ways that he has chosen not to do after the sixth day and later. This being so, are all of you listed above saying that the velocity of light was near infinite on the fourth day to be able to get to the earth? I realize that ASC is a convention and ESC is a different type of convention, but whichever we choose, light IS and HAS TO travel at SOME speed to get to the earth, is it not? I fully accept the idea of the language of the Bible, and determining the velocity of light requires knowing a distance between two points and then defining what simultaneity is between those points. Even if we keep these aside for the time being, light from those objects MUST get here, and it MUST has some velocity, even from God’s omnipresent perspective because He being in all places (while we also know he is NOT a part of what he has made) IS the definer of simultaneity. Do you all therefore believe the velocity of light was near infinite until light got to earth on say the end of the fourth day? After the fourth day, God could have made velocity to what it is now, and that ultra high speed light which has gone past earth from the fourth day on we will never be able to study since those photons have gone past us and we can never catch up. We cannot measure the one-way speed of light. Therefore, we can safely say it is not an observable in the universe. As a result we can choose the one-way speed towards the observer as infinite. In the physics this comes from the Reichenbach synchronization parameter (ε), which we are free to choose. So….and I know this is not the answer you want….we cannot empirically know what the one-way speed is. But under the natural language of timing events, if we say an event occurs when we see it happen (i.e we choose the ASC) we ARE defining the incoming speed of light (one-way) to be INFINITE. That is the best we can say. And yes, I agree light packets must have some velocity but the only measurable is the two-way (isotropic) speed. None of the authors listed in the papers discussed are suggesting any change in the two-way speed of light at any time in history. I think Vincent has hit upon something that I struggle with as well. I know we are “free to choose” and we can’t actually measure the one-way speed, and that under natural language of timing, an event occurs when we see it happen under ASC. But his question still stands: There has to be an absolute answer in reality – either the 1 way speed of light is the same in all directions (ESC), or the out bound is different than the in bound (ASC). It doesn’t matter how we want to define it in terms of our own language or convention; in reality it is either one or the other, it can’t be both. My question would be, why would (or how could) the one way speed be different in different directions? I understand conceptually that it can be different in the way physics and the math works, but that doesn’t give me an answer to why or how. Until I can answer that question to any satisfaction, it seems like this ASC model is very much akin to a loophole and seems like the easy way out for creation astronomers in terms of the light travel time problem. If the answer is simply “we can’t measure it so we can’t be sure so we can choose what we want and we will choose the parameter that gives us a young earth friendly answer”, I don’t know how this can be a sustainable argument. Just because something is not measurable does not rule it out. Relativity predicts many strange results, some that have been confirmed and some that will never be. But that does not mean those that cannot be measured are not so. It seems God, not man, created the universe in such a way that we cannot measure the one way speed of light. So you cannot ask your question–it is an ill-formed question. The universe is what it is and personal preference has nothing to do with it. Yes, just because something is not measurable does not rule it out. But it can’t mean that all possibilities are all true at the same time (ie, ESC and ASC). This may help my confusion if you could answer this: Does a true believer in the ASC model believe that light actually travels instantaneously in the out bound and slower on the in bound? Or do they just believe it is just a timing convention (phenomenological language)? In your Youtube video “Starlight and Time: Is it a brick wall for biblical creation?” it seems to me that you are advocating for both ASC and ESC, ie, you are claiming that the millions of years under ESC causes the tired light, but under ASC it arrives instantaneously. So which is it? It can’t be both! To be clear, I am asking questions out of humility and from the position of wanting to be able to explain this model accurately to friends who are interested in listening. It comes down to the confusion of the use of phrases like “we are free to choose convention” and the “language used in the bible”. I understand you can explain starlight travel time in terms of ASC convention language, but is it right to say that the ASC model is arguing that that is exactly what happened in the cosmos in reality? You may have not understood what I wrote in the article. The ESC and ASC are two of an infinite number of possible choices of clock synchrony conventions that are allowable. Without choosing a convention no measurement is possible. So in that sense both are true. But the physics is unchanged regardless which convention you choose. Now that does not mean you won’t get different times for events–you will. It is the whole point here. How do we synchronise distant clocks? We must choose a convention. Under one convention events may be simultaneous but another another they won’t be. The same can be said of time zones on Earth. I can say it is 8:00 am in Perth but 12:00 am in London at the same time. Both are simultaneously true. But another country that does not recognise this convention might say the times are different. Nevertheless, any outcome of an experiment will be unaffected by the choice of convention. The one-way speed of light is a consequence of one’s choice of clock synchrony convention. Not the reverse. Absolutely the ASC is a convention. Now you ask does it ‘actually’ travel at infinite speed? Since it is not measureable that is a question no one can answer. It is not a matter of belief either. Yes it can. As I wrote, the physics is unaffected by our choice of coordinates or timing convention, so we choose the one of most convenience to elucidate the physics under question. It make the math easier to understand when it is the least complex so we choose that. For one other situation we may choose an alternate coordinate system. This we do all the time in the solar system for navigating. There is the Sun Centred Celestial Frame, or the Earth-Centred Inertial Frame, or Earth-Centred Earth-fixed Frame etc. The ASC and the ASC model are two different things. The first is the convention and the second is a specific model by Lisle which uses the ASC. The major point here is which is the language used in the Genesis creation account? The ASC model argues that that is what it is. So, yes, the Bible teaches us the reality of the cosmos, and the ASC model proposes how that can be understood and consistent with the biblical texts. The other two models by Tenev et al and Dennis also do the same thing.